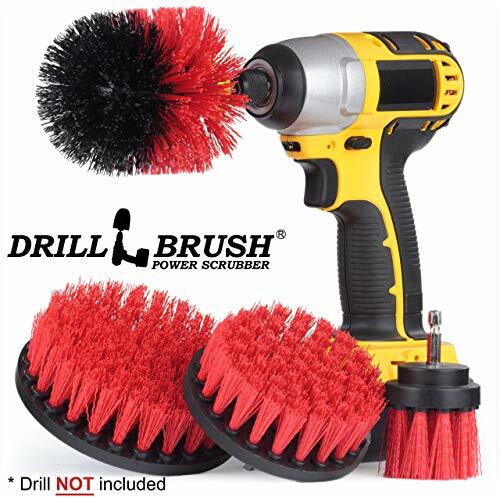 This four piece power brush kit contains an Original Drillbrush Power Scrubber in Stiff bristle Red and Black, a 2 inch, a 4 inch, and a 5 inch round Red aggressive scrub brush. The 2 inch brush is perfect for tight areas and corners. The 4 inch and 5 inch brush are for larger surfaces but are still easily maneuvered around contours. Stainless steel shaft fits in most cordless drills. Durable construction, not available in retail stores. See our other Amazon Drillbrush listings to purchase these brushes separately and see our great customer reviews. We also carry the largest line of drill powered brushes available for many applications.Cordless drill NOT included Drill NOT included. Brushes are made with stiff bristle fiber and our securely attached to the block. All Drillbrush Products have a 90 day no questions asked Money back Guarantee. If you are not completely satisfied with our product we will issue a full refund or ship out a replacement at the buyer's request. Cordless Drill NOT included. If you have any questions about this product by Drillbrush, contact us by completing and submitting the form below. If you are looking for a specif part number, please include it with your message. © 2019 - nonlineagency.com. All Rights Reserved.